Yellowstone National Park began capturing bison last Saturday as it starts trimming a northern herd estimated at about 4,000 animals. This is the same herd popular with hunters in the Gardiner area. Last year the National Park Service delayed its trapping to see if hunters could increase their take, alleviating some of the need for shipping bison to slaughter. The result was a huge tribal take by the four participating treaty tribes, about 380 bison. 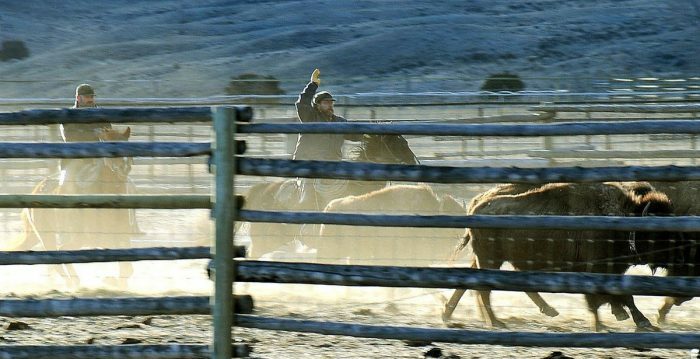 Another 100 were shipped to slaughter, which fell below the park’s goal of removing about 900 bison. The park is hoping to remove at least 900 animals again this year, if not more, to try and rein in the growing bison population. To read more about the issue, or about how more bison means more winter meat for wolves and other predators inside the park, see my stories online in the Billings Gazette at http://bgz.tt/n2roo and http://bgz.tt/bhgew.